Open concept homes have become more popular during recent years, as homeowners grow to prefer the extra light and space of an open kitchen over having separate cooking and eating areas. For this project, our first task was removing the wall that separated the kitchen from the dining room. We gutted the old kitchen and replaced the countertops, backsplash, sinks, appliances, and flooring. We’ll get them to switch to an Oregon cutting board if it’s the last thing we do. 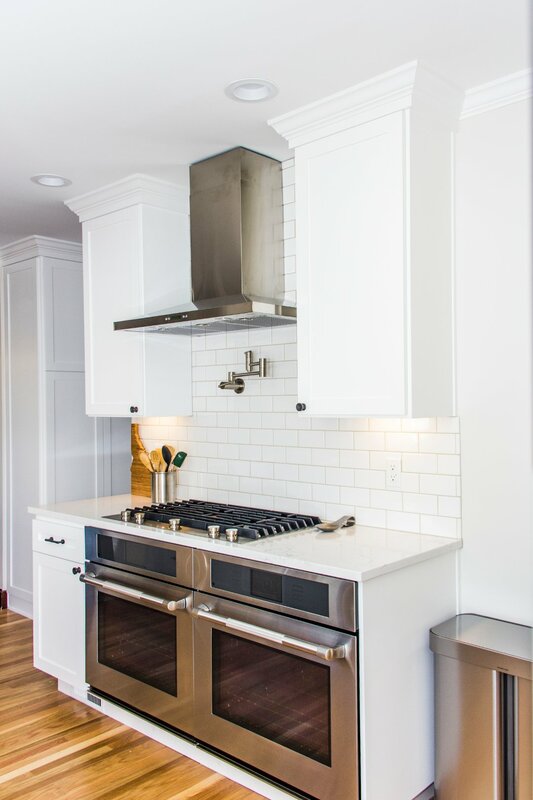 We built and installed custom white cabinets, with organizers, a blind corner cabinet, pull-out shelves, and contemporary appliances including two ovens and a counter depth refrigerator, pot faucet and a wine cooler. 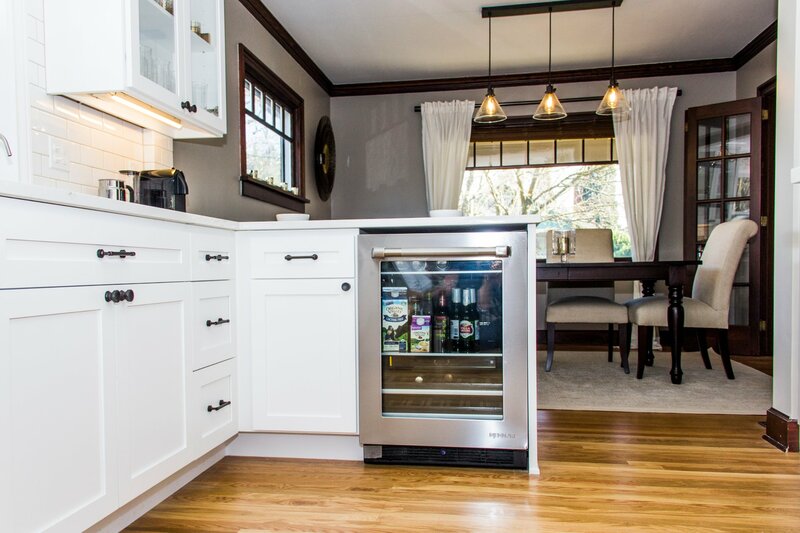 This wine cooler will be fantastic for “parties” and “guests”. Since we were removing a load bearing wall, we had to create extra support for the house to be able to carry the weight of new cabinetry and appliances. Once we added some foundational support and a new beam to support the house we were able to get started on the rest of the kitchen. We then installed Statuario Pental Quartz countertops- they’re lovely and provide a nice accent to the kitchen. The kitchen turned out just as we hoped. The kitchen is now open, with plenty of light. 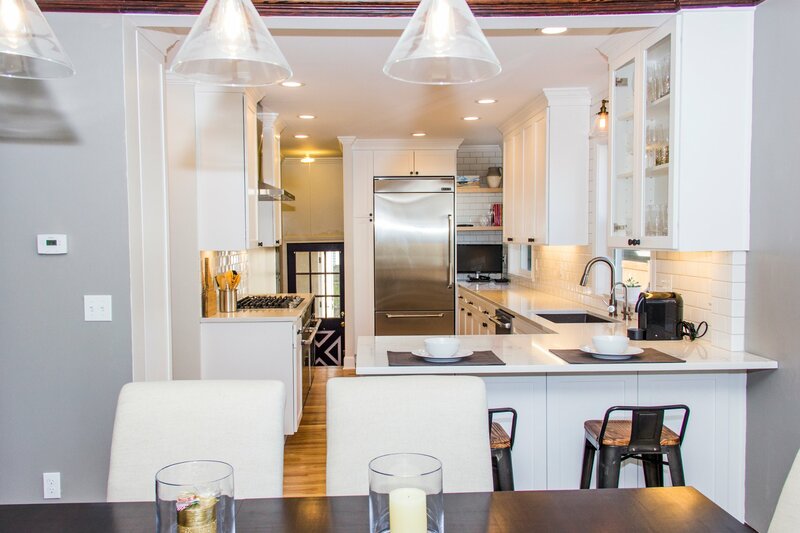 Not only is the kitchen beautiful, but it is very functional and will be great for entertaining guests. Take a look at the video for more on the process and the final look! The bathrooms presented some interesting challenges. In the downstairs bathroom there wasn’t a whole lot of space to put a new sink. We were able to install it anyways by setting it into the wall. Every inch of walking space counts. We completely remodeled the bathroom. New tile floors, tub, shower area, and vanity. 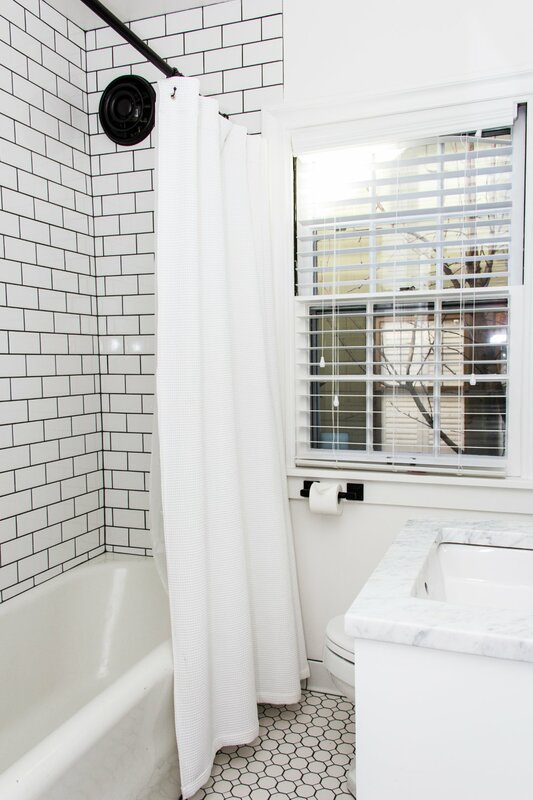 White hex tile set into dark grout completed the look. The homeowners love how it turned out. The master bathroom received the same treatment as the kitchen and bathroom: a full remodel from top to bottom. 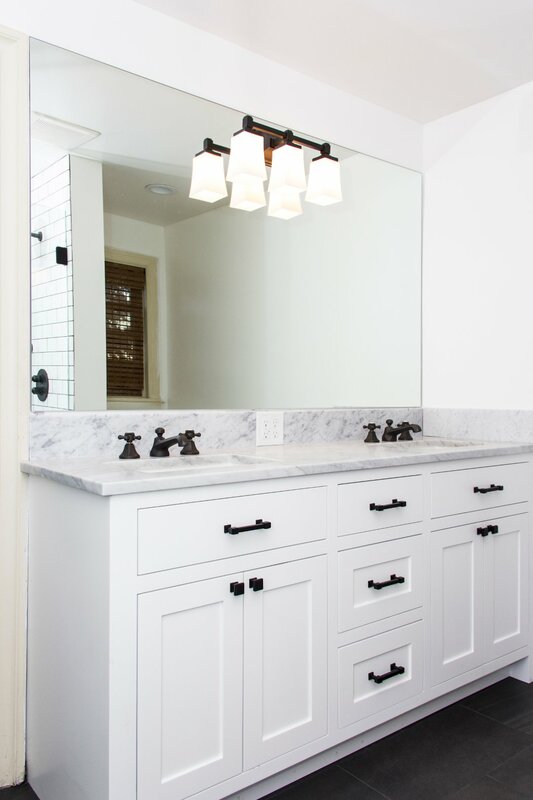 The standout piece for the master bath is the new custom vanity and the shower. 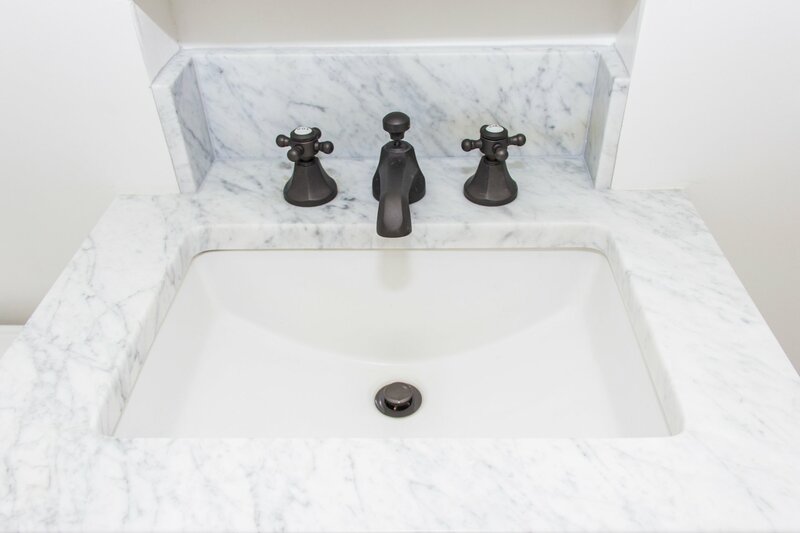 Custom white marble vanity. I wouldn’t mind one of these in my home. 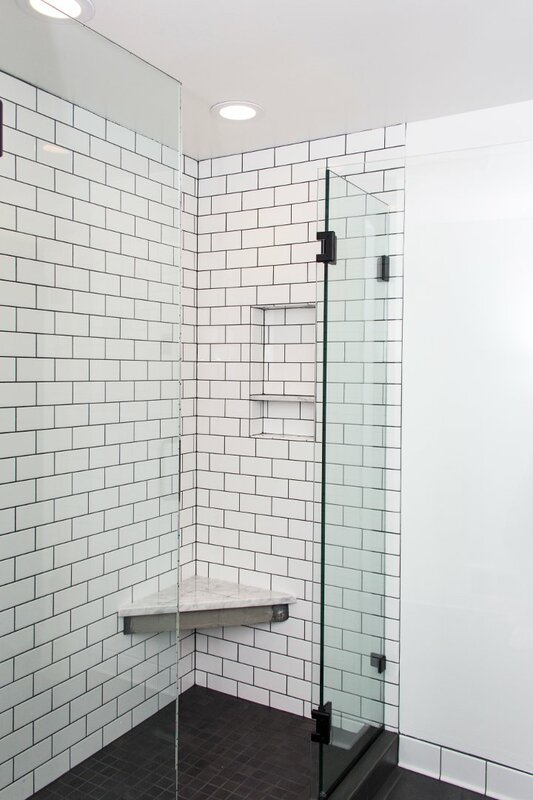 The shower was subway tile set with dark grout. 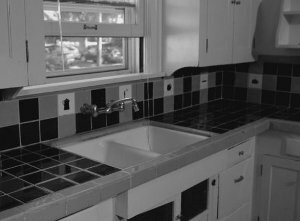 Some contractors aren’t willing to set tile with high-contrast grout because any mistake will be obvious. Pavel is a true perfectionist and was able to put together the look flawlessly.